The story, as I heard it, was that after Dr. Land took a picture of a young relative, the child asked, “Why can’t I see it now?” Sometime after that, the instant photography market was born. In these days of digital imaging and social media, it seems that few people even think about that original question anymore. Since we can see it right away, either on the back of the camera or on our smartphone. Enter the Fujifilm Instax Mini 90 Neo Classic instant film camera and film. There’s just something about holding an actual print, though, that really satisfies our need to hold and touch stuff. This is what Polaroid capitalized on for several decades. By the 1970s and ’80s, instant film technology had progressed to the point that you didn’t need to peel apart the picture from the developing pack side. The photo was self-contained (aka integral) with no mess and nothing to throw away. Also by that time, other film manufacturers had joined the market with their own products. A series of lawsuits muddied the waters for about a decade around then, too. When it was all settled, it seemed that instant film was pretty much only either for professional medium and large format photographers, or users of very low-end consumer cameras. And the cost per image was going up for those cheaper cameras. Around this period, the consumer video camera market had exploded as well. I bring this up because it shows how the general market was changing for average people. While photo enthusiasts were still well served by the continuing 35mm SLR cameras, and digital imaging SLRs were growing ever more capable, the average Jane and Joe consumers were moving on to wanting to have instant gratification without needing to think too much about making the images. By the late 1990’s we had all sorts of choices for consumer-level imaging. There were small digital point and shoot cameras, very small and rather inexpensive video camcorders, and cell phones and smartphones with ever more capable digital cameras built into them. However, apparently, there was still a potential market for small, inexpensive cameras to provide actual physical prints to hold, pass around, and keep in a wallet. 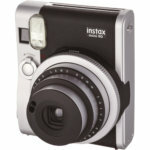 In 1998, Fujifilm decided to tap into that market with the Instax integral instant film and cameras. The Instax Mini 90 Neo Classic from Fujifilm is an instant film camera with modern features and a classic feel. It uses a fixed, slightly wide-angle lens, three user set focusing ranges, automatic exposure with partial user override, built-in automatic flash, and motorized film ejection. A finished picture is about the size of a credit card, the image area inside is 62mm x 46mm or roughly 2 1/2 x 1 3/4 inches. This is considerably smaller than ‘Polaroids’ were but is still a valid print size. It equals a ‘wallet size’ print, more or less. Numbers aside, it is a decent size for fun snapshots. The colors and contrast of the image are vibrant, reminiscent of FujiColor 35mm color negative film. There is no backing to peel apart, no goo to spread, the developing agent and film dyes are integral. Prints are not archival quality, but they are fade and yellowing resistant, so you can keep them a long time. Film packs are small, lightweight, and reasonably priced. The battery for Instax cameras is in the camera, not in the film packs. Battery is a rechargeable lithium-ion, a charge lasts for 10 film packs. A variety of exposure modes can be set by pressing the mode button on the back and turning the ring around the lens. Modes are Auto Flash, Normal, Kids, Party, Landscape, Macro, Bulb Exposure (up to 10 secs), and Double Exposure. A brightness control override of plus or minus three stops allows for customization, creativity, and control over difficult lighting. As with instant film of times past, you spend a picture each time you check exposure. Fuji seems to be targeting this line of cameras as people picture takers. The easy vertical orientation of this camera makes vertical portraits very easy to take. The placement of one of the shutter release buttons on the front makes holding the camera in portrait mode quite natural feeling. Even the logo and model name on the front is in portrait orientation. There is also a shutter release on top of the camera for landscape or horizontal picture taking. Using the camera is simple. An optical viewfinder is used for framing, and focus modes are dependent on the mode dial. Most of the time, the focus is set between 3 to 9 feet. With the wide angle lens and its relatively small maximum aperture, depth of focus is pretty deep. Changing the mode to landscape also sets the focus for further subjects, 9 ft to infinity. Macro mode is optimized for close up, about 1 foot to 2 1/2 feet. Flash can be set for automatic, always on, always off, or red-eye reduction which pre flashes 3 low power bursts before releasing the shutter. Bring this camera anywhere and you will soon be in the center of all the action and interest. These photographs, though slightly small, are a huge hit with groups of people. I would even say that you could probably offer the pics for sale. How I did it on a couple of event shoots is I added an option for handing out instant photos to attendees. I charged just enough to cover my expected film use for the event. As I shot the event and candids I delivered digitally as spelled out in the contract, I also shot Instax pics and handed them out to the people I was photographing. These were corporate events. The same idea should also work for weddings. Shooting instant pics just for fun with my friends and family is really fun, too. Kids and adults alike enjoy holding the pics and passing them around. I also found myself having a great time wandering around in my home neighborhood, looking for things to experiment on with the Instax film and cameras. Fujifilm Instax Mini 90 Neo Classic is a great little camera. While not a professional level camera, the quality of the camera and the images are very high. It is a camera primarily used for fun, especially great for people pictures at events both large and small.